Design by: Pentagram (DJ Stout, Austin). Ed.’s Notes: It’s definitely an improvement but it’s hard to associate that kind of star drawing with higher education than Hollywood/Entertainment industry. Type is super pretty though. A few application image below (or after the jump) and more at the link. Relevant links: Pentagram case study. About: (Est. 1904) \"Oklahoma City University is a coeducational, urban private university located in Oklahoma City, in the Uptown district. The university is affiliated with the United Methodist Church and offers a wide variety of degrees in the liberal arts, fine arts, sciences and business. The only Oklahoma institution listed in the top tier of the regional, master's-level university category by U.S. News and World Report, Oklahoma City University is also listed in Forbes' \"Best Christian Colleges\" & \"100 Best College Buys.\"\"
Ed. 's Notes: It's definitely an improvement but it's hard to associate that kind of star drawing with higher education than Hollywood/Entertainment industry. Type is super pretty though. A few application image below (or after the jump) and more at the link. Select quote: \"Before Stout and Delgado redesigned it, OCU's primary logo featured a silhouetted likeness of the university's iconic Gold Star Tower, a 286-foot red brick tower built in 1953 to honor Methodists who died in World War II. 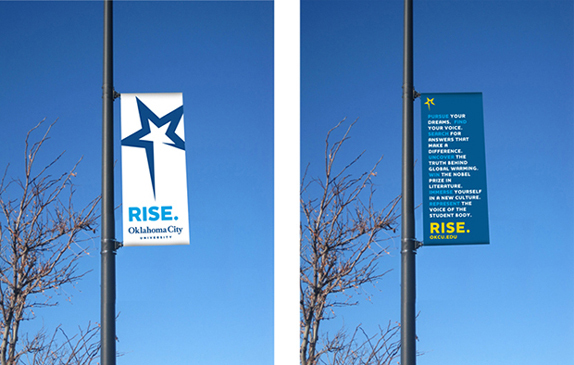 The tower, an Oklahoma City landmark located prominently in the center of campus, is topped off with a 200-pound star positioned at the end of a long pole like a star on a Christmas tree. 'OCU's sports teams are called The Stars after the Gold Star Tower, and many of the university's celebrity alumni, like the Tony Award-winning Kristin Chenoweth, are singers and dancers and 'stars' of the stage,' says Stout. 'So it only seemed natural to turn their static star into a dancing star, with just a hint of the long pole it's attached to at the top of that building. '\"